The next time you enjoy a Nutella sandwich, you can feel good knowing those hazelnuts likely came from a sustainable source. 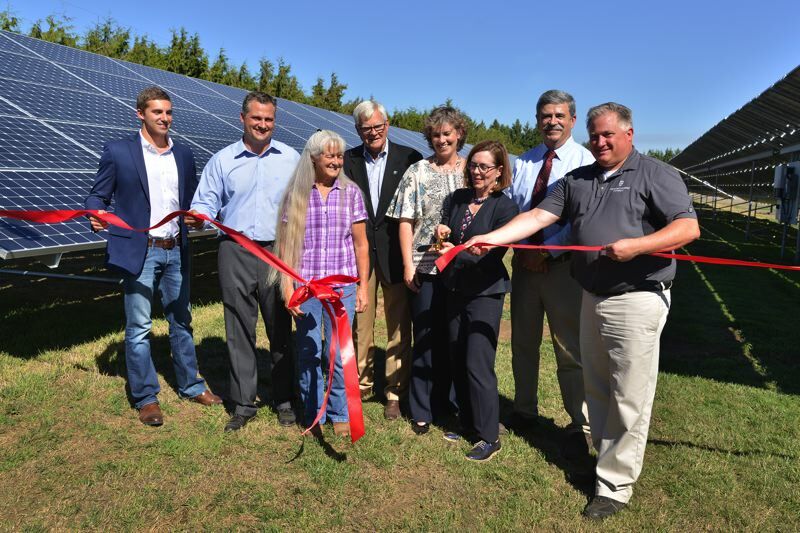 The Northwest Hazelnut Co. — based in Hubbard, just north of Woodburn — just celebrated completion of its solar array project, which nearly eliminates its carbon footprint and makes it the first all-solar powered hazelnut processing plant in the world. It's a landmark accomplishment for the state's hazelnut industry, which is seeing rapid growth due to increased demand for Oregon hazelnuts — considered bigger, sweeter and juicier than others produced worldwide. Hazelnuts, also known as filberts, aren't just used on sandwich spreads like Nutella. The paste is used in most European chocolates, and they're also sold roasted, diced, sliced and for other innovative retail products. For Northwest Hazelnut co-owner Larry George, a former Oregon state senator who established the company in 1994, going solar makes both economic and marketing sense. It "obviously helps financially, cutting our costs," George says. "But the big issue is so many of our customers, like Ferraro (the maker of Nutella), Kraft and Nestle are looking for ingredients that are grown in a sustainable way." Oregon supports 600 to 800 hazelnut growers, mostly small family operations in the Willamette Valley plus some in Southern Oregon. The nuts thrive in temperate climates with rich, volcanic soil and need little to no irrigation. WIth such a low impact on the land, Oregon's hazelnuts are seen as a green industry, George says. But on a processing level, he hadn't implemented a lot of sustainability efforts yet at Northwest Hazelnut Co., which is the largest hazelnut processor in the United States. The solar array is the first move toward that goal. "We think this gives us a huge advantage, both locally and internationally," George says. "Ferarro conducts a sustainability audit on their major suppliers. They come out and review all of our procedures." In fact, the new solar array — designed to generate 549,200 kilowatt-hours of electricity per year — began out of one of those audits about two years ago, he says. It's not just Northwest Hazelnut that will see the boon. "Hazelnuts are growing like crazy," George says, thanks to an increased focus on heart-healthy foods and a Mediterranean diet. Oregon's hazelnut growers comprise about 98 percent of the U.S. market and 4 percent of the worldwide market. George sees that increasing, due to the demand for Oregon's sustainably grown nuts. Oregon traditionally had about 30,000 acres of hazelnut trees in the ground, but that recently more than doubled to 70,000 acres, George says, which will mean production will triple in the next seven years. "If we continue on this growth pattern, planting 8,000 to 10,000 acres per year, we think the industry can get to 20 percent of the world market in 15 to 20 years," George says. "That would be huge. The Willamette Valley can be a major producer of hazelnuts in the world." Currently, hazelnuts are the state's No. 11 agricultural product. George predicts they could rise to No. 5 as demand and volume increase. George, who came from a family of hazelnut farmers, founded the business out of his dorm room at Oregon State University, along with his younger brother, Shaun. 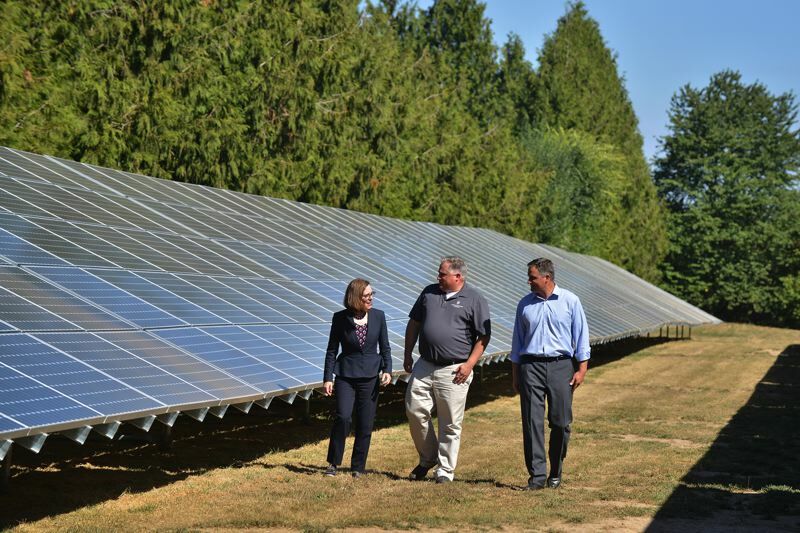 The solar array at the Hubbard plant is the first of a series of energy upgrades at their four plants — the others are near Salem and in Newberg. The solar array allows them to pull power onto their grid in the summer months, with the surplus going to their utility under a "net metering" system. Then in the winter, when they're processing, the utility provides free credits for the extra solar it used during the sunnier months. In effect, 100 percent of the facility's energy comes from solar power. "I love hazelnuts, which is why I'm here today; I eat them every morning on my oatmeal," Brown told the crowd of about 150, including state legislators and county commissioners. She added: "Northwest Hazelnut is one of many examples that prove that Oregon can be a meaningful part of the solution to the global climate challenge, while creating jobs and boosting our economy. 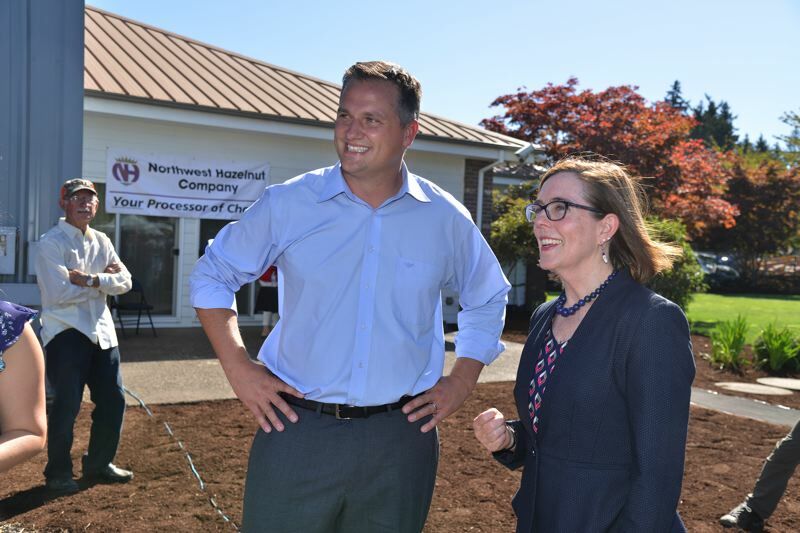 This is a proud moment for rural Oregon and our agricultural sector."